Could the newest farmhand be a drone? Research in the College of Agriculture and Life Sciences is bringing drone technology to agriculture, one of the major industries with excellent potential for growth. 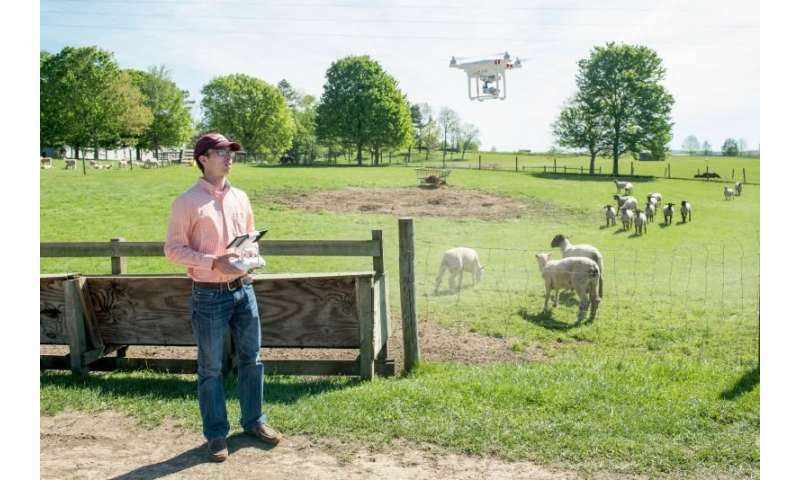 Specifically, drone technology is being tested with sheep at Virginia Tech. "We are looking at ways drones can be used on small farms," said Dan Swafford, project associate for Virginia Cooperative Extension. "Farms could use drones as a 'check-on' tool to ensure that sheep are where they are supposed to be." Drones can help farmers gain quick access to see if an animal is in need or injured, to examine if a ewe has delivered a new lamb, or more generally to check the status of the farm. Agriculture is one of the industries where drones will make a big impact in the coming years. A report from PricewaterhouseCoopers found that the potential market for agricultural drones is $32.4 billion because high-tech systems with the ability to monitor crops or livestock can reduce human errors and save time and money. Last year, Extension held a field day during which experts showed how automated tools such as drones can help farmers with precision agriculture. Across the college, others are working with drones on everything from monitoring crops to sampling microbes in the air. Swafford's project started with a conversation in the hallway a little over a year ago. "Hey, do you want to go fly drones over sheep?" Swafford recalls asking Andrew Weaver, a former graduate student in the Department of Animal and Poultry Science. Weaver, who graduated from Virginia Tech with a master's degree and is now pursuing his doctorate at West Virginia University, was a natural fit because he had been working with sheep and had a private pilot's license. A natural partnership was born. Swafford and Weaver based their methodology on research with drones over crops and with other types of livestock to see if sheep would react to having a drone nearby. A drone with a video camera was flown over the herd, and the duo recorded how sheep reacted to the device at different positions overhead. Sheep were exposed to drones from 75 feet above to as close as 10 feet in decreasing intervals. Some walked away while others ignored the drone. A few gazed quizzically at the device. "We kept a scoring system to see how flighty the sheep were." Weaver said. "They learned that it was ok, and with regular flying they got used to it." The major finding was that sheep learned that a drone is just part of life. After being exposed to the machine several times, most of the animals did not appear to notice. The technology has a lot of practical applications and could change the way farmers, including those with disabilities, manage livestock. On small farms, a farmer armed with a drone can save time, while covering considerably more ground. A drone can cover the span of two football fields from a single aerial location. "We wanted this to be straightforward and efficient for any farmer who wanted it," Swafford said. The technology is easy to use, and the equipment is lightweight and affordable. A hobby drone model usually retails for about $500, and includes all of the technology a farmer would require. It connects to any tablet using a wireless internet connection. Most models take still photos and video. Simple controls make a drone easy to fly, and auto take-off and landing features enable beginning pilots to start flying in a matter of minutes. The next step is getting the technology into the hands of farmers. Swafford, a former high school agriculture teacher, is showing drones and the research to student 4-H members. He's applying for grants that will allow students to take drones back to their family farms and test them with their parents. "We're targeting farm youth," he said. "They have an understanding of the practical nature of using drones with livestock, and they understand that it's more than just cool technology."